The US Special Operations Command(US SOCOM) issued a solicitation for the procurement of SOF Combat Assault Rifles (SCAR)on October 15th, 2003. This solicitation requested a new combat rifle, specially tailored for the current and proposed future needs of the US Special Forces, which are somewhat different from then current US Army requirements, which were being fulfilled (unsuccessfully) by the newest Heckler-Koch XM8 assault rifle. 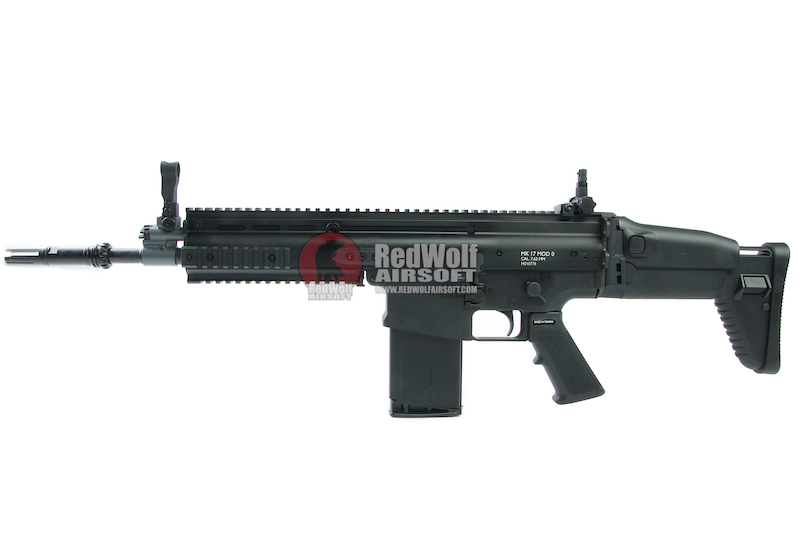 The key difference in basic requirements between XM8 and SCAR was that, while XM8 was a single-caliber weapon system, tailored for 5.56x45mm NATO ammunition, the SCAR would be available in various different calibers. 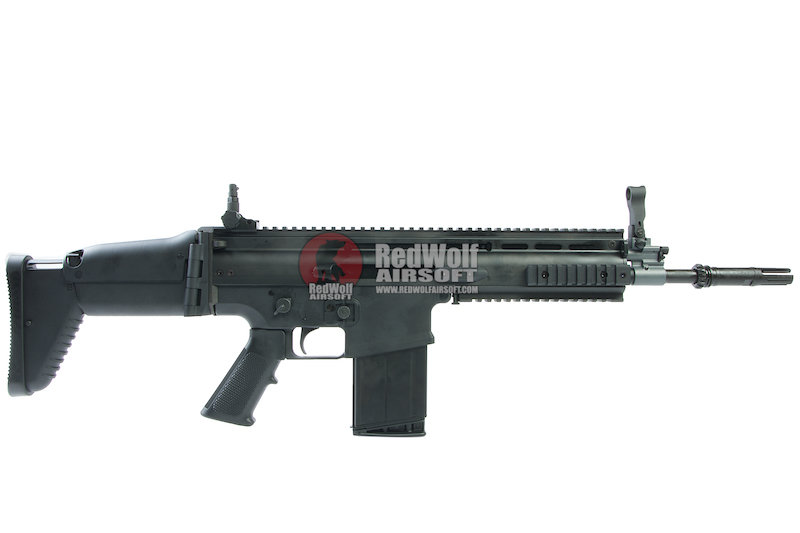 Initial SOF requirements included two basic versions of SCAR system - the SCAR Light (SCAR-L), available in 5.56mm NATO, and the SCAR heavy (SCAR-H), which should be initially available in significantly more powerful 7.62x51 NATO chambering, and should be easily adaptable in the field to other chamberings (this still is not the case).The key idea of SCAR rifle system is that it will provide the Special Forces operators with wide variety of options, from short-barreled 5.56mm SCAR-L CQC variation, tailored for urban close combat, and up to long range 7.62x51 SCAR-H Sniper variant. Both SCAR-L and SCAR-H are available in three basic versions, Standard(S), Close Quarters Combat (CQC) and Long Barrel (LB). All these variants, regardless the caliber and exact configuration, will provide the operator with the same controls layout, same handling and maintenance procedures, and same optional equipment, such as sights,scopes, andother current and future attachments. Cybergun is one of the manufacturers out there with the most liceses for making licensed airsoft replicas that suits a variety of markets. This time Cybergun have introduced us the FN SCAR-Heavy (SCAR-H), which is the .308/ 7.62 NATO twin to the SCAR-Light (SCAR-L), not only it has the most correct dimensions and markings, it is also made in the gas blowback format that gives you the extra realism and kick when you pull the trigger. prviously in two tone tan color now in the all new black colour scheme, the upper receiver is made in metal with a anodized finish and paired with a weight lightening polymer lower receiver. Inside is a gas blowback system that gives a better kick than the other SCAR-H GBBs out there in the market. . 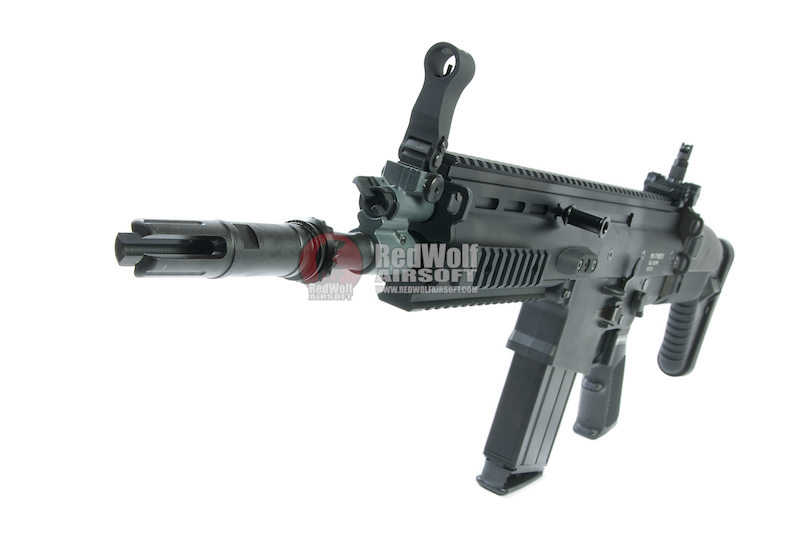 The upper receiver features a 13 inch carbine length barrel with the AAC type flash hider and have rails on all 4 sides, that gives great flexibility to fulfill with mission requirements, no matter it's laser designators, flashlights, fore grips, backup sights you will find enough space to fit them all on if required so. 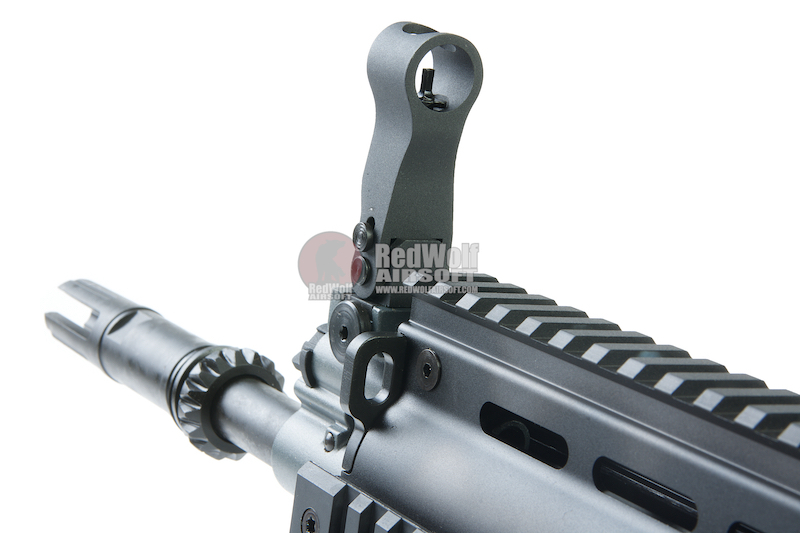 Hop up adjustment is located behind the lower rail, adjustable with flat head screw drivers. Charging handle is reciprocating, and could be changed to either side tailored to user's preference. 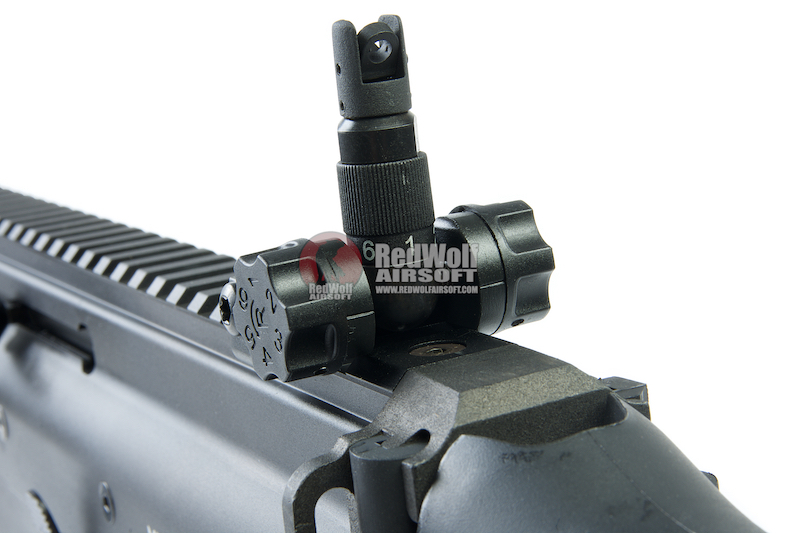 Iron sights are flip up 600m type with windage and elevation adjustments. . 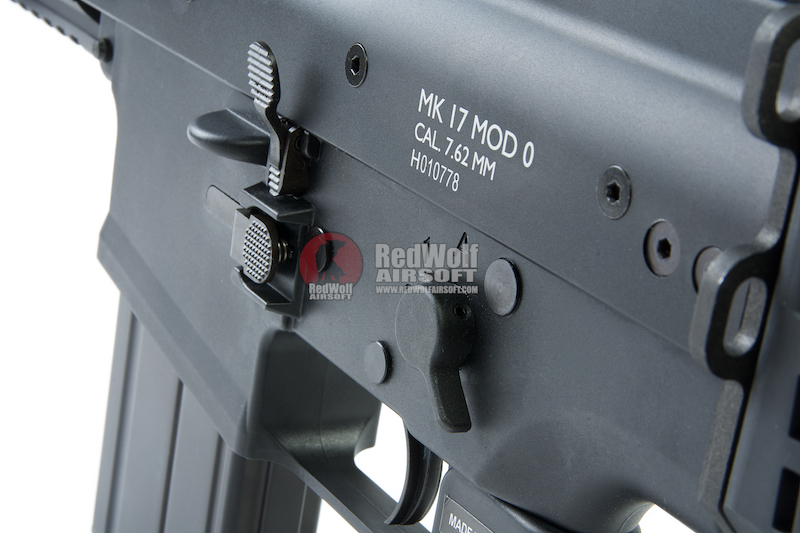 In the lower receiver features a pistol grip that is interchangeable with other M4 GBB grips in the market. 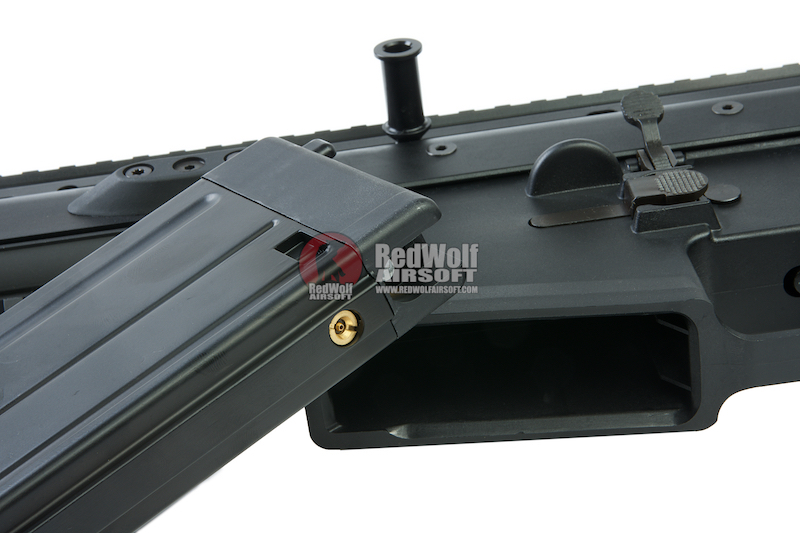 The lower receiver also have ambidextrous magazine release and ambidextrous fire selector with the bolt release on the left. The buttstock is the most iconic feature of the SCAR series that is foldable, 6 position retractable and have an adjustable cheekrest. .
With the strong kick, reliable gas system and the SCAR platform makes this gun both fun and deadly as a DMR platform. Just get an AAC silencer and you are totally Ghost Recon ready (silencers are not included! ).